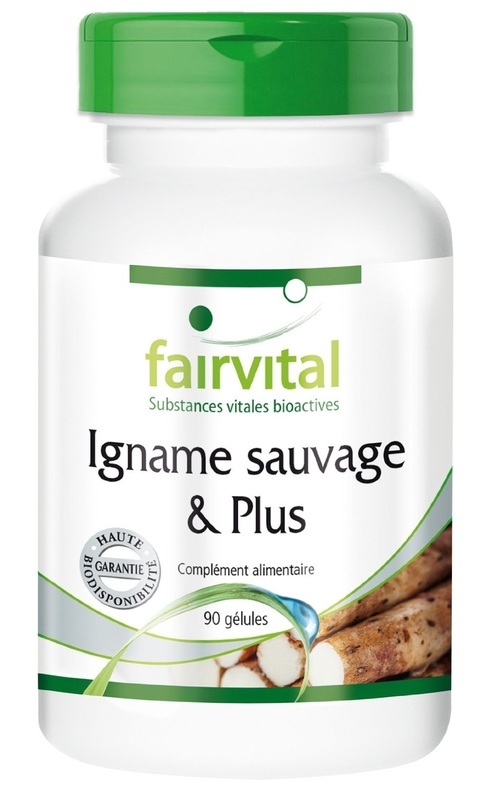 When I was asked to test some of Fairvital's supplements, this brand was not known to me, so I did my my usual research and discovered that Fairvital is a German manufacturer with sales channels in Germany and France. The other thing I discovered was their astounding range: more than 360 vitamins, minerals, all-in-one and specific nutritional supplements. Their website lists 16 categories of supplements (such as co-enzymes, antioxidants, plant extracts, adaptogens) and 26 target applications (i.e. liver, joints, eyes, memory, anti-age, etc.). The site also groups their supplements by Blood Type, which is what I used in arriving at my choices. They had approached me via my website and offered me a choice of five of their products, absolutely without restrictions or steering on their part. I thought this was impressive in itself and showed supreme confidence in the quality and validity of their product line. All their products are certified free of GMO, artificial colouring and fillers, and are formulated for high absorption. Their practices are in line with the highest levels of purity, hygiene and the standards of HACCP and GMP. Even the packaging uses the safest plastics (PET et HDPE) without phthalates. The contents are more than generous and the prices very moderate for such high quality. If I sound like a fan girl, it's because I am. I have been buying health supplements on line for 20 years and have seldom come across such a serious and confidence-giving presentation. Collagen is the most important protein in the human body, and the scaffolding of our skin. Together with water, it is the the most influential element and its gradual decrease is what causes visible ageing. It makes sense to try and counteract its loss with a dietary supplement. 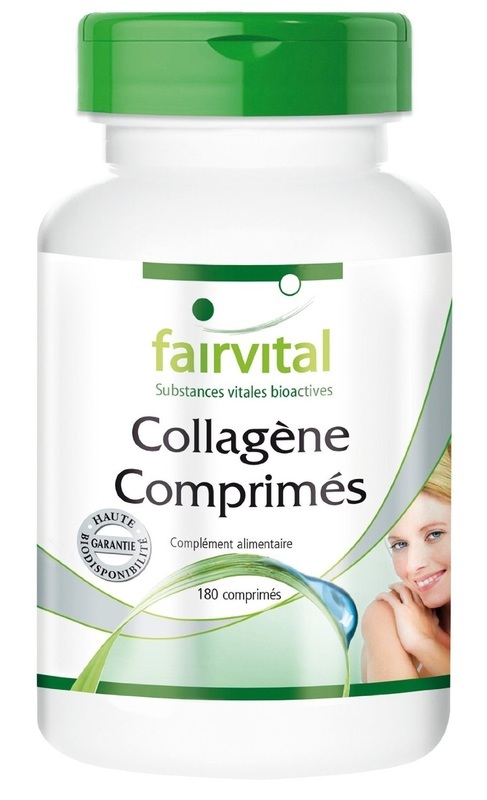 Fairvital's Collagen tablets are large, and since I have difficulty swallowing dry pills, I found that soya milk helps me with just about anything that would otherwise stick in my throat. The recommended dose is 2 to 4 tablets a day to be taken on an empty stomach. 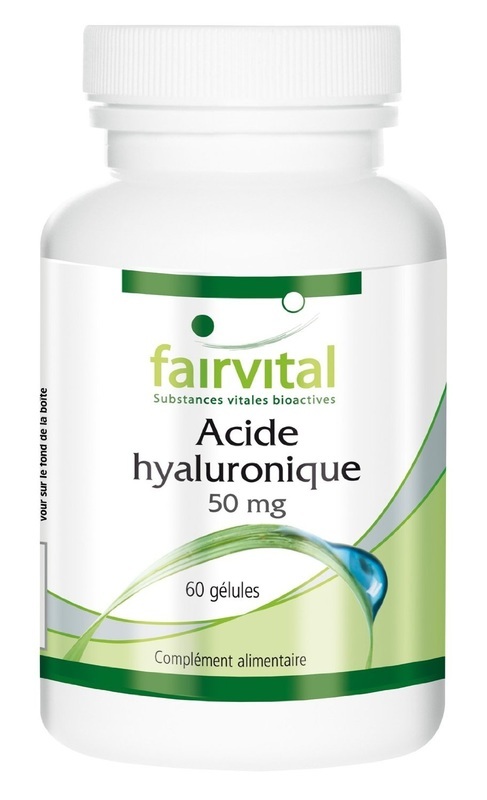 During my 4-week test period, I have been taking 2 per day, but I have been taking this in addition to Hyaluronic Acid, which has a similar effect. After a month of combined intake, I can see some positive results in the texture of my skin. Normally winter is brutal for ageing skin, indoor air is dry and there is no sun to give our complexions a flattering glow. So to see an improvement in my skin in January it proof to me that what I'm taking is having an effect. The other benefit is in lubricating my joints, something which I definitely need. Since starting these Collagen tablets, my chronic hip pain has diminished and that to me is critically important because it also allows me to continue to exercise which, in turn, is essential for my mood. By great good luck I have escaped my family's curse of varicose veins, however, my circulation has never been perfect. My hands are often cold and, since breaking a leg last year, summertime has caused me some problems with oedema, or venous insufficiency - what Europeans colourfully call “heavy legs”. Add to this, the inevitable effects of ageing on the elasticity of all bodily tissues, and you can understand why I am willing to try a few things. For two months I took Vitiven, a plant-based supplement containing an extract of red wine leaves, and saw only minimal improvement. 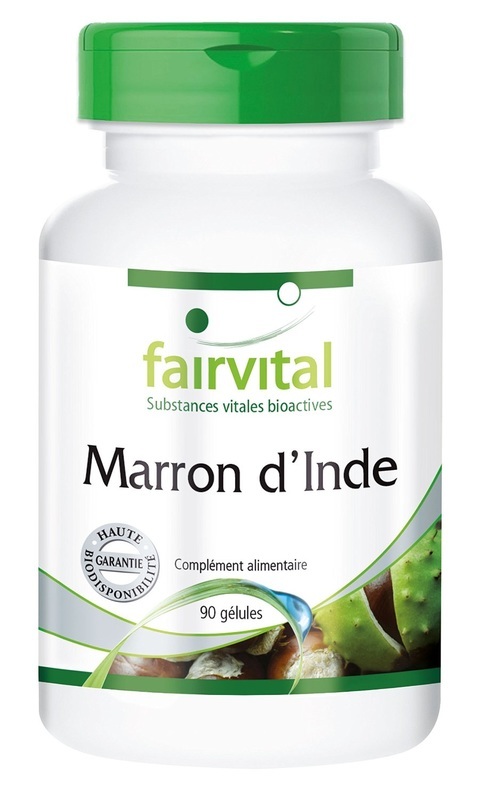 When Fairvital offered me a free sample of some of their micro-nutrients, I asked to try the Horse Chestnut capsules. There are 90 capsules in the bottle. After a week taking the recommended 3 per day, I have cut down to 1 or 2 a day because I read that horse chestnut might interfere with anticoagulants (which my doctor has prescribed). Even at this lower dosage, I have noticed a definite improvement, especially at the end of a sedentary day. It's true that mine is not a very serious case, but it does help when I have to spend several hours sitting at the computer and not moving about as much as I should. So, based on my limited experience, there have been benefits and no undesirable side effects which, I think, is all one can ask for from a herbal supplement. Hyaluronic acid has the effect of retaining water in tissues. In the human body it is said to improve skin elasticity and restore synovial fluid in the joints. There is some debate regarding its efficacy when taken orally as opposed to being injected. I tried a similar supplement this summer and was amazed to notice that it had a fast effect on my chronic hip pain. The benefits lasted for weeks after I finished the bottle, well into October, but eventually the pain returned. 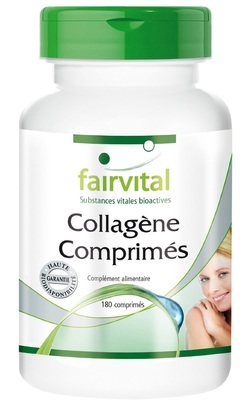 I started taking this Fairvital supplement in late November, one capsule a day, increasing to two daily over a week. A month later I am again pain-free, despite never quite achieving the full recommended intake of four capsules a day (mostly because I don't eat that often). I am delighted to find that a daily intake of 100 mg has been effective for me, essentially half the recommended dose. There are 60 capsules in each bottle, enough for 15 days, at full strength. The improvement in my joint mobility is a huge deal for me. As anyone suffering chronic pain will confirm, breaking the cycle is essential to preserve your sanity, so a supplement like this can literally change your life, or certainly your quality of life. A secondary benefit is a lessening in the appearance of my lines and wrinkles but, realistically, at 62 I don't expect anything too dramatic. My face looks more rested and my skin is less dry, so I am pleased with the cosmetic benefits but the real thrill is to be able to move without pain. One important point: it is essential to drink 1.5 to 2 litres of water a day because Hyaluronic Acid binds to water and so requires high levels of hydration within the body to work best. As long as these supplements work for me, I will continue to take them, while we all wait for the scientific community to come up with some definitive proof one way or the other. This is a supplement we have been taking for at least 10 years, and in that time we have sampled many brands and concentrations. With this brand, you get 90 capsules in each container, of 500 mg strength, which is a fairly powerful amount. The specified dose is 1 capsule per day with a meal, so a container is enough for three months. Resveratrol is the active ingredient in red wine. In its natural state it has the task of protecting grapes from fungal and bacterial infections. Taken in concentrated form as a supplement, it is a powerful antioxidant and immune system booster. It also improves blood circulation by regulating the flow of blood, keeping vein walls strong and preventing blood clots. It also has other beneficial effects on the human body that result in slowing down the ageing process. It is mostly for these anti-ageing benefits that we have added it to the supplements we take on a regular basis. 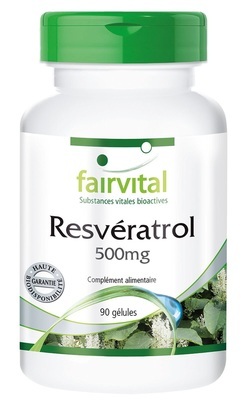 I think it's a good idea to space out your Resveratrol intake: four to six weeks and then take a break of a week or two. Since we have been on this supplement by Fairvital, our energy levels have been high, our resistance to colds and seasonal problems has been pretty good and I feel that we are doing all we can to remain active and youthful with the help of a quality product. Wild yam, Vitamins C and E, Beta Carotene, Zinc and Selenium are combined in this well-balanced and well-tolerated dietary supplement, designed to promote the body's own production of DHEA, which in turn is essential for the production of testosterone in men and oestradiol in women. Dropping levels of DHEA are responsible for ageing and it makes sense to me to try and address, and revert this deficiency, which has catastrophic effects on all parts of the human body. We cannot get DHEA from food. It is produced naturally by the body, in decreasing quantities as we age, and is implicated in many important areas: cardiovascular health, cholesterol levels, memory, immune system, bone density, vitality, well-being, hormonal levels. It can alleviate symptoms of the menopause and rebalance testosterone and oestrogen, it is helpful in reducing fat accumulations, it protects cell integrity and regulates libido. In the bottle there are 90 easy to swallow capsules, enough for three months at the recommended daily dose of one capsule per day. As I was testing a different supplement, my husband became the test subject for this over the last month. He reports that this wild yam supplement worked really well for him in several ways, especially in sustaining energy levels, mood, libido and exercise recovery. We have found that it is always better to rotate health supplements so that the ones that work for you continue to be effective. He felt that this is a very useful product to use in alternation with Resveratrol, Maca and a straight Testosterone Booster as many of the benefits overlap.